Light flaky, tender and moist cod wrapped in a beer batter and fried until crispy and golden brown; served in a baguette with coleslaw and tartar sauce. Over the last few days as I have been contemplating my St. Patrick’s Day dishes, but I could not get the thought of fish and chips out of my head. After a while I decided that the easiest way to get past the road block was to simply give in and make some fish and chips. I do not make fish and chips all that often so when I do I like to indulge a bit and I go with cod for the fish. Cod is my favourite fish for fish and chips as it has an amazing texture after frying that just goes perfectly with the crispy coating. Speaking of the batter, with all of the thoughts of St Patrick’s day I could hardly not go with a beer batter and a Guinness beer batter at that! At this point another one of my recent obsessions, an obsession with po’boys, took hold, and I could not resist turning the fish and chips meal into a crispy fried fish sandwich with fries. So the idea was a fried fish sandwich but the fish was looking rather lonely in the bun all by itself and a dollop of mayo was certainly not going to be good enough! We needed some serious condiments for this proud and noble fried cod in a bun! After a quick thought about a remoulade sauce was dismissed as not being Irish enough, I realized that I would be missing out on my favourite fish and chips sides, the creamy coleslaw and the tangy tartar sauce and with that I had my condiments and they would do the cod proud! Dip the fish into the batter and lightly shake off the excess. Fry the fish in preheated 375F/190C oil until cooked, golden brown and crispy, about 4-5 minutes. Oh my. This is what I must have for St. Paddy's day lunch. I've never had cod–it wasn't local when I lived in Florida, and I was spoiled on the fish my Dad caught–but the way people talk about it makes me want to try. And what better way to try something new than battered and fried? Ohhhhh, my goodness. Can you come cook at my house, please? This looks excellent. There is no day that isn't made better with the addition of fish and chips! The coleslaw is a nice, non-traditional addition! Wowza!! This looks fantastic! 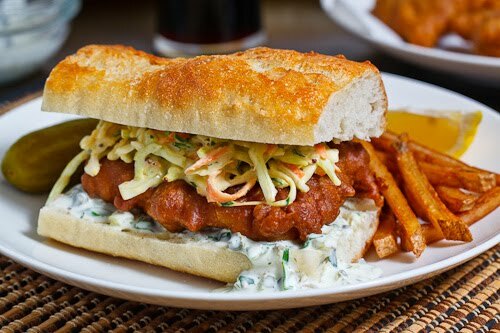 Fish and chips is one of my husbands favorites meals, but this looks SO much better =) Now you have me craving a fish or shrimp po'boy haha. This looks SO good. I've been craving some good fish and chips, and the pictures are making me want to whip this recipe up right now! Love a beer batter. that looks really flippin' good! I have to remember not to look at Kevin's food right before bedtime. Hehe this really screams New Zealand (the fish and chips aspect I mean)! When we get around to cleaning out our deep fryer this will be right up the list to make. Fried fish has become a highlight on our menu since I found the recipe on your site a few years agao!! Now you take it to a whole new level, I am eager to try this!! You seriously need to have your own cooking show. Or move to san francisco and open a restaurant. you can never go wrong with beer battered fish! That sandwich looks devilishly scrumptious! What a beauty. Que sandwich tan delicioso, madre mía que cosa tan buena. I love how you let your craving take over so that you could make this beautiful sandwich! This sandwich sounds great. Beer batter is always a good idea. Looks excellent! I really need to get a fryalator (sp?) to make treats like this for my bf! I have yet to try your fish and chips Kevin, bit on a sandwich with creamy coleslaw and homemade tartar sauce I am more than tempted. My mouth is watering and it's only 9:30am!! Wow, this looks good. O man I want to be your friend!!!! 🙂 This looks so awesome!!!!! I'm a fat girl who would love to swim in your sandwich :0) Great blog..Just discovered you..
Oh YES! So glad you added the coleslaw & tartar sauce! I'm sure this smelled delicious! This looks delicious! I'll have to give it a try sometime soon! Beer batter rocks! This looks delicious! NOM NOM. this is what i want to eat RIGHT NOW. Oh my goodness! That looks perfect! I have never made deep-fried fish at home, but this sure is tempting! Kevin, this looks AMAZING!! 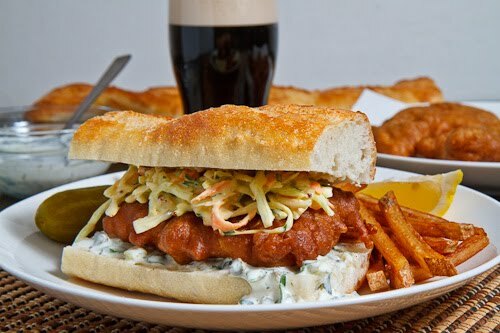 I love fish sandwiches, and haven't made beer-battered fish in a long time… I think I'm gonna have to go to the grocery store this afternoon to pick up the ingredients for this! How perfect is this for St. Paddy's day? I LOVE fried fish and add some carbs for a sandwich and I am even more smitten. great blog, by the way. i'm your newest follower! I love fish and chips and make it quite often. I really like the idea of putting in a sandwhich. Will have to this this a try tomorrow on St. Paddy's Day! This looks sooooo good! Thanks for sharing! All the words in the name of this recipe caught my attention immediately. This sandwich looks awesome! that looks so delicious that I almost want to die because I don't have it. What is the point of living without that sandwich? I must make that sandwich. You're a genius, you know that, right? Oooh yes please can I have one of those?! Looks amazing! SnowWhite: I normally write out a meal plan, gather the recipes and write out a grocery list for the next week and then go and get all of the groceries at once. Since I have a small kitchen I do not use anything special for frying dishes like this. I just use a very large sauce pan to make sure that it does not over flow when it bubbles up when you add things to the oil. There should't be any smoke when making this dish. Finally someone who posts something other than Irish stew and cabbage! Way to go Kevin, I love seeing something a little different for this St. Paddy's Day. This is an awesome idea! I love how crispy your batter looks – perfect weekend food. If this isn't mouthwatering, I don't know what is. Oh, this looks absolutely amazing. 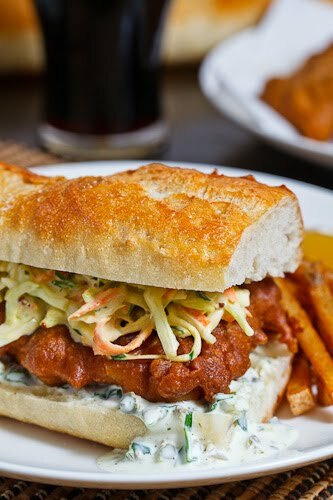 What a great spin on both fried fish and po' boys! You killed it! From the perfectly fried fish, to those good looking chips. And the Guinness in the background. Awesome. This looks like a great seafood recipe for a hot summer day. We love the reference to fish and chips, with the addition of the coleslaw. This sandwich is a great reference to European food influences. Thanks for sharing, we'll have to give this a try soon! I loved this recipe! tartar sauce made ​​me understand the pickles and now I love him. excellent meal, which turned into a post on my blog and an amazing sandwich. I tried this for supper tonight and loved the taste. I think I might have undercooked it a bit because the batter lost it's crunch quickly and when my bf and I bit into the sandwich the fish went everywhere out the sides.Will try this again and hopefully perfect it next time. Also tried your recipe for pan seared salmon with sour cream dill sauce and loved it! This looks fantastic! I love a good fish sandwich, and this sounds like one I'll definitely be making up in my kitchen! I tried this batter & it is fabulous… My spousal unit owned and operated a fish & chips stand & fried thousands of ponds of fish over the years & he thinks this is even better than his original recipe! Your tartar sauce is great too as it is dang close to mine… I always add a drop or three of worchestershire sauce to pump it up a notch! Deb French: I am glad that you like it! Great call adding the worcestershire sauce to the tartar sauce!